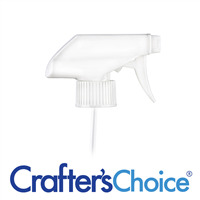 This natural colored trigger spray comes with a lock on it to prevent unwanted leaking or spraying. Turn the lock on the nozzle to "OFF" to lock and "ON" to open. 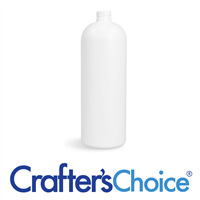 Closure and sprayer top for larger bottles of liquid product. Height: 11" Length: 2 3/4"
Cut dip tube at an angle to fit bottle if necessary then twist on appropriate sized bottle. To unlock sprayer, turn switch on the nozzle to read "ON". Pull trigger to spray. Switch to "OFF" to lock. COMMENTS: Great for room sprays and other home essentials. COMMENTS: They work great and look great with the natural bottles. Customers like this sprayer better than the mini sprayer as well. COMMENTS: Use these with the 32 ounce bottle for home cleaning needs. So many uses. Very good quality. "I only see 3 bottles for this top and all are really big. I am looking for 6oz bottles to go with these. Do you have any that I am just missing? 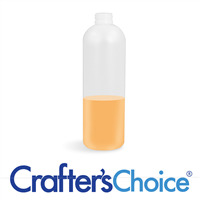 Thank You"
Staff Answer We do carry a 24/410 Trigger Sprayer that would fit a smaller bottle: http://www.wholesalesuppliesplus.com/products/24-410-natural-mini-trigger-sprayer.aspx.